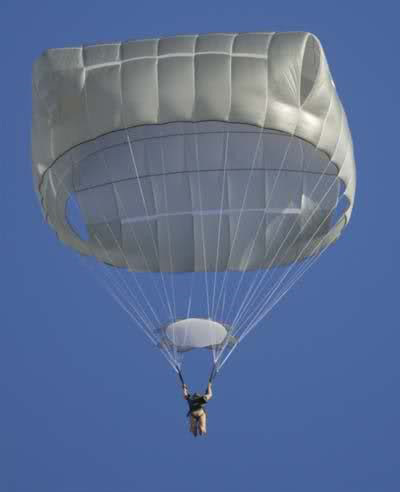 The Advanced Tactical Parachute System (T-11) is intended to replace 50,000 T-10 parachute system and will provide the airborne Soldier with the first modernization of the tactical parachute system since the 1950s. The T-11 is available for US military only. It is suitable for a wide range of Soldier sizes, from the 5th percentile female to the 95th percentile male Soldier. It enables a stable, safe rate of descent that reduces landing injuries and permits the parachutist to carry a heavier load. The T-11 consists of three components: a completely redesigned main, T-11R reserve parachute and the T-11 harness system. The main canopy is a highly modified version of a cross-cruciform platform, with a 14 percent increase in inflated diameter and a 28 percent increase in surface area compared with its predecessor, the T-10D assembly. The T-11R reserve canopy has an aeroconical design that promotes fast opening of the reserve system during low-speed malfunctions. It also features an omni-directional, center-pull deployment system. The T-11 harness, because of higher placement of the D-rings, is designed to displace opening shock forces on the axis of the jumper’s body. All Canopy Assemblies are manufactured in strict accordance with Personal Parachute U.S. Military Specifications MIL-DTL-6645, MIL-DTL-7567 and MIL-STD-849, latest revisions.